Green Plains is a historic 617-acre waterfront estate dating back to 1798. It is located at the mouth of Chesapeake Bay, within 30 miles of America’s Historic Triangle (Williamsburg, Jamestown, Yorktown). The mansion house, built in the late 1700s or very early 1800s, is approximately 7,000 square feet (square footage is an estimate by owner, to be verified by buyer) and sits on over 2 miles of pristine water frontage with deep water, perfect for boating. Private long pier will accommodate just about any size boat. The main house is accompanied by five charming Cape Cod bungalows. One equestrian barn and one hay barn with 15 flexible stalls, perfect for equestrian use, are part of this sale. With a diverse terrain of woods, pasture, hay meadows, and tidal wetlands, Green Plains serves as an annual stopover for waterfowl along the Atlantic Flyway. Its historic scalloped walls enclose an acre of gardens and orchards, including what is reputed to be the largest pecan tree in the United States. This grand estate, previously owned by the famous Cabot Family, was listed as high as $22 million and last listed at $12 million. Please, send me more information on this property: MLS# 1909237 – $5,400,000 – 1599 Chapel Neck Road, North, VA 23128. 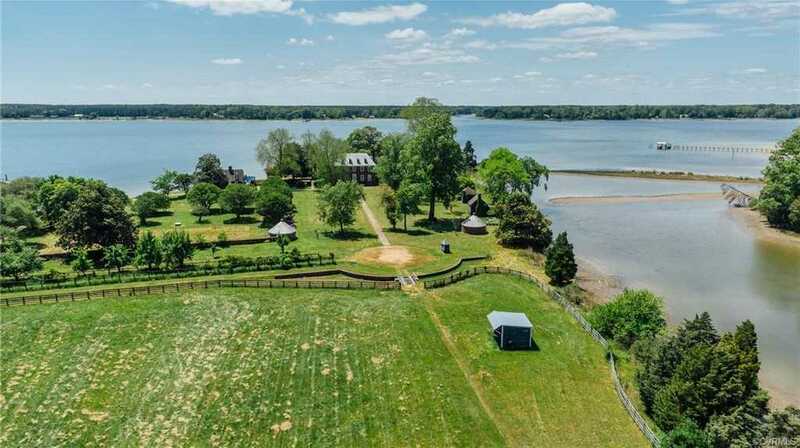 I would like to schedule a showing appointment for this property: MLS# 1909237 – $5,400,000 – 1599 Chapel Neck Road, North, VA 23128.